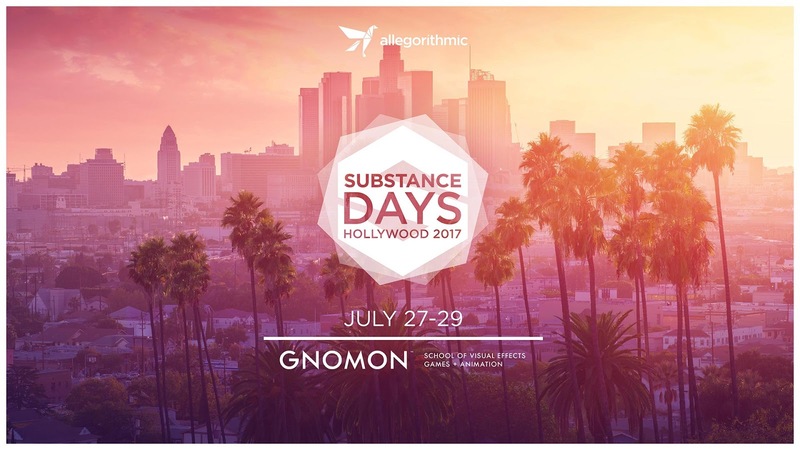 [ #CG Event #SubstanceDesigner #news #vfx ] Substance Days which happens immediately before the SIGGRAPH 2017 would be happening from the 27th to 29th of July in Hollywood, and Gnomon would be hosting the Substance Days Hollywood 2017 version for the second year in a row. This year’s exciting guest speakers include top artists from Santa Monica Studio, CD Projeckt RED, The Mill, Treyarch, Insomniac Games, and Visceral Games. As Substance is gradually becoming an industry standard in the fields of VFX, animation, design, and architecture – which will be one of the focuses of Substance Days; showcasing how artists specializing in a variety of industries can harness the power of Allegorithmic’s comprehensive ecosystem of tools. •Free art and pipeline-focused Saturday Sessions (Jul 29) from 9 AM to 6 PM, with free lunch and refreshments. The Keynote and Saturday Sessions will also be Livestreamed! Check out their website for more information on the program.